Many of us turn to comforting foods and beverages in times of stress. We also often rely on certain foods and beverages when we need to address other moods or conditions, such as fatigue, anxiety and even an upset tummy. I encourage you to read about this category of ingredients in an article I recently wrote for Food Business News. It can be found HERE. There are many opportunities in dairy for botanicals. 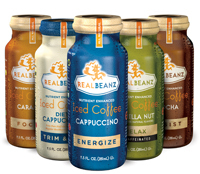 The Food Business News article provides a number of examples, such as RealBeanz Energize (pictured), which is cappuccino with ginseng and vitamin B12. And stay tuned…I will profile a brand new product this Monday in the Daily Dose of Dairy. Make sure you are subscribed to receive it. Have a great weekend. And please, Chicago teachers, agree on a contract and let’s get my son back in the classroom.